See better and farther when driving at night. Replace your dim factory incandescent headlamp with an advanced Quadratec LED upgrade. Our lamp assembly features a solid state maintenance free design and advanced photometric technology for years of a brighter, crisper and whiter light output thats closer to the color temperature of actual daylight. Guaranteed to deliver dramatic improvements in light projection distance and overall visibility or your money back! Lenses have a distinct customized appearance bringing smart styling and function to a higher level. The rugged construction starts with a die-cast aluminum housing and crystal clear polycarbonate lenses for optimum protection against impacts. The solid state electronics and powerful Phillips® brand light emitting diodes (LEDs) are protected by water tight epoxy seals. This drop-in replacement is truly plug-n-play requiring no modifications and installation takes only 20-30 minutes. Headlamps feature horizontal LED modules that divide the high and low beam reflectors. 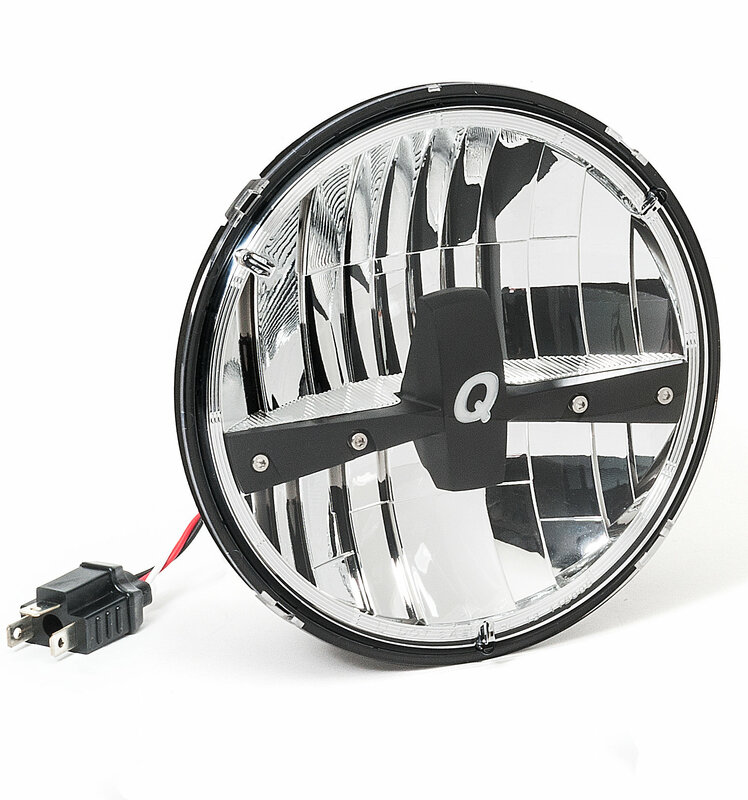 The top half of the lamp features the low beam light source that's powered by one super powerful 15 watt LED. When the high beam is activated, the bottom half becomes illuminated by four additional high powered 3 watt LEDs. These battery friendly lamp draws much less electricity than conventional incandescent lamps making them easier on your charging system. Our lamp exceeds DOT and federal motor vehicle safety standards (FMVSS #108) and are approved for highway use in all 50 states. This is a true drop in replacement for all 7 round dual beam headlamp designs and come with Quadratec's 3 Year Limited Warranty.